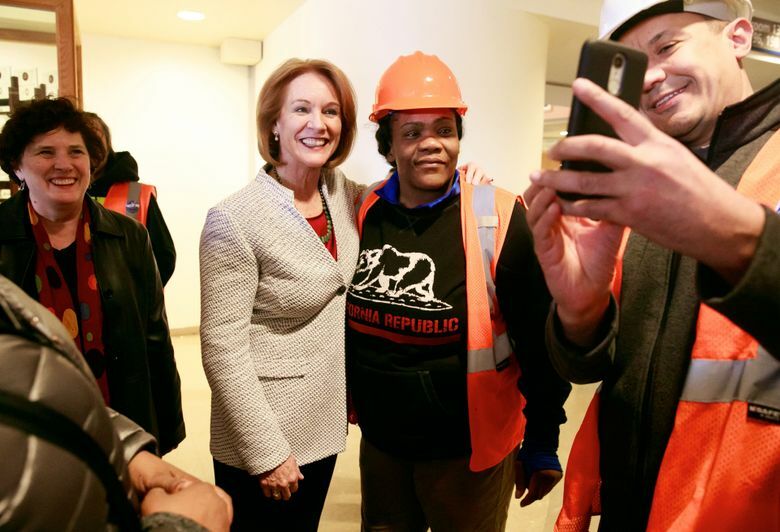 Mayor Jenny Durkan is facing a homeless crisis, residents and business owners questioning Seattle’s spending, and City Council members pushing a tax on large employers that would raise $75 million a year for housing and homeless services. 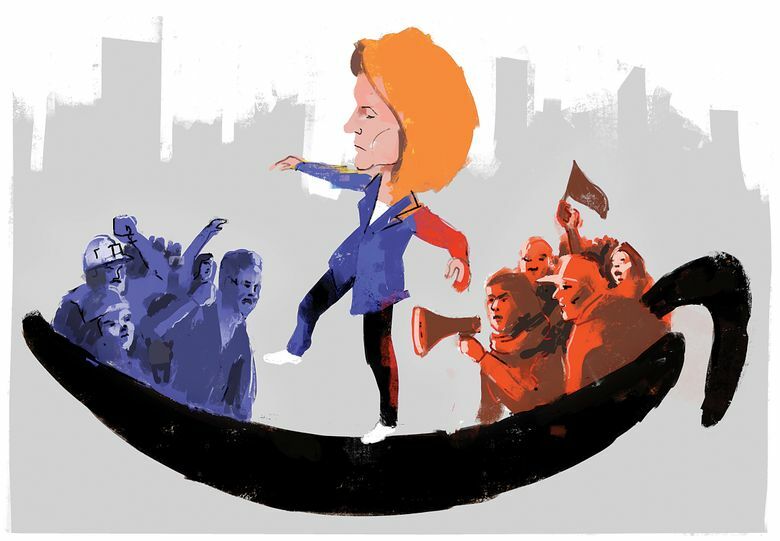 In running for Seattle mayor last year, Jenny Durkan promised to unite a ruptured political community and work to bridge a gaping divide between rich and poor. The former U.S. attorney scored support from both business and labor, and she won the November election decisively. Under her predecessor, voters had coalesced behind tax increases to help City Hall keep up with Seattle’s surging population and economy. “We can only do this if we do it together. Let’s do it together,” Durkan said in her first State of the City address in February, drawing applause at Rainier Beach High School. Just a few months later, Durkan finds herself caught between a homeless crisis showing no signs of abating, residents and business owners increasingly questioning Seattle’s spending and City Council members pushing for a new tax on large employers that would raise $75 million a year for housing and homeless services. Amazon raised the stakes last week with a very public warning, pausing planning for an office tower over the $500-per-worker tax, declaring that the company might sublease a skyscraper and raising the possibility it could curb a jobs expansion that’s helped Seattle prosper. Debates are now raging, with homeowners screaming at council members in Ballard and iron workers confronting socialists in the Denny Triangle. The mayor has choices, each with political consequences. She could usher the tax into law, underlining her commitment to helping vulnerable people, but alienating Amazon and voters who don’t trust City Hall to spend wisely. Or Durkan could try to block the tax with a veto, responding to pressure from the council’s critics but leaving low-income- housing dollars on the table and exposing herself to those who would accuse her of shilling for big business. During months of talk over the so-called “head tax,” Durkan mostly stayed out. Now she’s calling for tempers to cool and vowing to seek common ground. “I’m not a person who’s going to make threats or ultimatums,” she said. An Amazon-related slowdown in development could drain money from a city treasury heavily reliant on tax revenues tied to a yearslong building boom, the mayor says. The e-commerce behemoth has declined to comment since announcing it would put on hold its plan for a 17-story tower on property where it has been letting a nonprofit use an old hotel as a homeless shelter. Yet opposing the tax would mean siding with Amazon CEO Jeff Bezos, the world’s richest man, who recently bragged about spending some of his $130 billion fortune on space travel. Tech-company hiring has contributed to the housing-cost hikes knocking many residents out of Seattle, where they can’t enjoy the fruits of the city’s success. It’s a test for Durkan. Though the mayor has signed a pact with King County to improve coordination on homeless services, she believes extra dollars also are needed. “Efficiencies alone won’t solve this problem,” Durkan said. She could angle for a cheaper or different tax but would need to convince the council members who have been driving the conversation. They’re not backing down. The mayor could instead pursue a property- or sales-tax increase, perhaps with the county, but many voters would balk at a plan to tax them directly rather than Amazon. A battle has been brewing since November, when the council voted 5-4 to reject a different head tax and instead set up a citizen task force to study the issue, beginning with a look at the problem — nearly 23,000 very poor households are paying more than half of their income on rent and more than 11,600 homeless people were tallied by a countywide point-in-time count last year (over a third of them black or Native American). The Seattle Metropolitan Chamber of Commerce — which represents Amazon and more than 2,000 other businesses — was invited but declined to take part. Using the task force’s recommendations as a guide, the council is now considering the $75 million-per-year measure and plans to vote as early as May 14. The proposal released last month with backing from five of the council’s nine members would in 2019 and 2020 impose a tax of 26 cents per employee hour on for-profit companies that gross at least $20 million per year in the city. Councilmembers Lisa Herbold, M. Lorena González, Mike O’Brien and Teresa Mosqueda are the sponsors, with Kshama Sawant also a supporter. Staff estimate the tax would apply to fewer than 600 city businesses. With about 45,000 workers here, Amazon would shoulder more than $20 million of the annual total. In 2021, the city would move to a 0.7 percent payroll tax. Because Amazon has many highly paid employees in Seattle, its annual liability likely would increase. The city’s budget for homeless programs has soared from $39 million a few years ago to $63 million this year. In 2016, voters replaced an expiring property-tax levy for affordable housing with a new levy twice the size, worth $290 million over seven years. Tax opponents accuse the city of squandering the money, while proponents argue the continued crisis demonstrates how great the need is. The dollars have helped pay for more shelters, tiny houses and apartments — and Seattle and King County have proved quietly effective at getting people into permanent housing, even as federal assistance has lagged. Between 2014 and 2017, the estimated number of people placed into permanent housing rose 62 percent countywide, reaching 9,591 last year, according to county data. But the number of people requesting services climbed 30 percent and housing waitlists now stretch more than five months, even for families. The number of people living outside has almost doubled, corresponding with Amazon hiring and spikes in rents and home prices. A record 169 people died on the streets last year and a shortage of health and addiction services is considered a factor. Supporters point to the waitlists as evidence that more subsidized units are needed, and a draft spending plan says the tax could yield 1,700 units over five years. The plan says a smaller chunk of the revenue would pay for trash pickup at encampments, parking for people living in vehicles and hygiene centers. Some money could be used to create the additional tiny-house villages Durkan has promised. “I’ve been waiting for housing for two years,” said Courtney O’Toole, who lives in a tiny-house village in Georgetown and sat on the council’s task force. None of the tax’s sponsors jumped ship last week, when Amazon weighed in. The retailer has been gobbling Seattle office space and is unlikely to wholly abandon its hometown. Wednesday’s announcement may be mostly a negotiating tactic. Still, the threat by the city’s largest employer to step away from buildings set for 7,000 workers has strengthened the Chamber’s hand. With Amazon recently announcing expansions in Vancouver, B.C., and Boston and inviting North American cities to compete for its second headquarters, the company has options. Durkan declined to endorse the idea of a head tax during her campaign. Last month, she issued a letter urging the council to exempt small businesses. Council members took that advice, but didn’t immediately agree to an oversight panel, nor to distribute tax credits when companies donate to homeless charities. And the Chamber wants to see the tax proposal killed off, period. “From the day I walked in the door, my mission was to oppose the head tax,” said President Marilyn Strickland, who took the post this year after serving as Tacoma mayor. Rather than taxing jobs, her members believe the city should use existing resources and consider bolder zoning changes to incentivize housing construction, Strickland said, calling Amazon an easy target. “People read headlines about Amazon being profitable but forget Amazon is part of a business ecosystem,” she said. “What happens is collateral damage” to smaller businesses. For the Chamber boss, the headlines Amazon made last week were no surprise. “Employers have a role to play but cannot serve as the city’s ATM,” she said. Strickland sees a chance for Durkan “not to find middle ground,” but to lead the way to an alternative approach involving the entire region. “The mayor has the power of veto and an opportunity to try to shape the direction this goes,” she said. The new tax needs five votes to pass, six to override a Durkan veto. Four council members have yet to sign on, though some of them in November pledged to support a head tax this year. Nickels said the mayor is wrestling with a council that’s moved left politically since his time. Of $600,000 given by a Chamber group to an independent, pro-Durkan political committee last year, Amazon donated $350,000. Separately, Amazon executives and employees donated $11,000 to Durkan’s campaign, according to public records. During the race, opposing candidate Cary Moon warned voters Durkan would be a voice for big business rather than ordinary people. Durkan rejected the assertion. Moon doesn’t think the tax’s sponsors can bend much, having already agreed to reduce the number of businesses covered and tax payroll starting in 2021, which would benefit low-margin businesses like supermarkets. A Seattle income tax on the rich has been struck down in court and homeowners already are dealing with property-tax increases in a state with the country’s most regressive tax system, leaving City Hall with few options. Greg LeRoy says the mayor should show the rest of the country how to stand up to Amazon. The executive director of Good Jobs First, a Washington, D.C.-based policy group, says the infamously tax- avoidant company — which just reported a quarterly profit of $1.6 billion — is attempting a “classic jobs blackmail” intended to scare other cities stiff. The mayor can remind Amazon about Seattle’s powerhouse research university, skilled workforce and quality of life, LeRoy says. Nick Licata, a former council member, says Durkan should portray the tax as a win-win. Economic engine — and bully? Resting with her two young daughters outside the Amazon-owned hotel that houses the shelter where they live, Jennifer sized up the situation. The 23-year-old, who asked to be identified only by her first name, was evicted in Tacoma after she says her husband lost a job and spent weeks living in a van. Her husband now works in Amazon’s Kent fulfillment center and Jennifer hopes to land a job with the company, too, so she understands its economic value, she says. But she sees a desperate need for more shelter in an increasingly unaffordable region. Amazon’s reaction to the proposed tax strikes her as wrong. “They’re like the schoolyard bully,” Jennifer said. A challenge for Durkan is gauging voter sentiment. There has been no public polling. The Martin Luther King County Labor Council, an umbrella group that supported Durkan last year, has endorsed the tax. Unionized construction workers are opposing it. Some voters sound tired of tax increases, no matter who’s paying. At town halls in Ballard and Sodo last week, residents angry over trash and camps and skeptical about City Hall achieving results bashed council members. On the other hand, many voters would welcome a pause in the techie growth that’s made the city super expensive and clogged its roads. 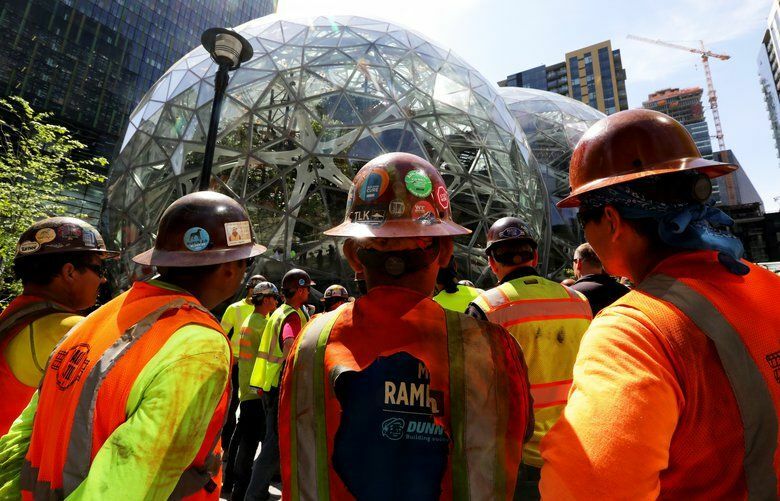 Seattle taxpayers and ratepayers have shelled out huge sums to accommodate Amazon with infrastructure upgrades. Better a head tax on large employers than yet another property- or sales-tax hike on tapped-out families, said former Councilmember Kirsten Harris-Talley, who served on the tax task force. All that had to be on the mayor’s mind this weekend, as she pondered what to do. Political reporter Jim Brunner and assistant metro editor Jonathan Martin contributed to this report.